Can I retire early? That is a fair question. Lots of people make that decision by looking at how much money they have at the time. I have always felt that the longer you work the shorter your lifespan due to stress. Therefore, the question should not be can I afford retirement;but ask how much of my life will be left if I retire right now? Seems like a Chinese fellow, Dr Sing Lin, PhD, made such a study and published a paper in 2002. If it is 10% true it ought to scare those that are still working, and give a clear answer to whether you should retire sooner than later. The study was commissioned after the pension funds of some large corporations were found to be "over funded" They were not paying out benefits to retirees based on normal actuarial tables. 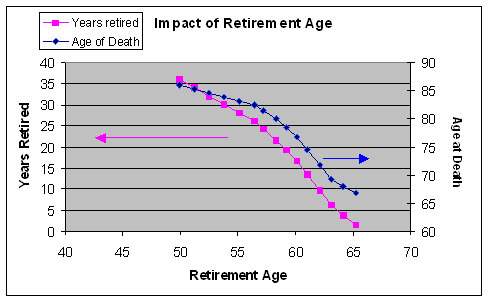 In other words retirees were dying before they were supposed to. Boeing, Lockheed Martin, ATT, Ford wanted to know why. I don't think they were worried about their retirees...probably more about their bottom line. I know that sounds cynical, but corporations can be downright heartless at times. The next time someone at your company offers you early retirement...read the above before you think it is to soon to retire. Time rather than money should be your number one driver in answering if you should retire early. This site can show you how to retire on less.